The actual racing began only in Kazakhstan. The 500 miles between Astana and Lake Balkhash is real hell even for powerful trucks. Photo: Astana - Balkhash stage of the Silk Way rally. RBTH correspondent Svetlana Brailovskaya is traveling with the drivers of Russia’s KAMAZ team as they take part in the Silk Way rally from Moscow to Beijing. Here she reports on the first half of the epic 7,000-mile race across Asia as the competitors navigate Russian off-road sections and the steppes of Kazakhstan. The Silk Way rally, a race for trucks and off-road vehicles from Moscow to Beijing, has crossed the half-way point. Behind are six legs that were traversed along the off-roads and steppes of Russia and Kazakhstan. The drivers themselves have called the first half of the competition just a warm-up – the real battle will be in China. It was impossible for drivers to race to their heart's desire in the first legs. From the very beginning in Moscow the caravan of off-roads and trucks was battered by rain. In such conditions, roads become impassable even for race cars, leading the organizers to keep reducing the length of the high-speed sections. The actual racing began only in Kazakhstan. The 500 miles between Astana and Lake Balkhash is real hell even for powerful trucks. The local steppe is extremely deceptive and affords the drivers no relaxation, despite the apparent good visibility: Even the most experienced can get stuck in a ravine or a saltmarsh. And the branches of the local Haloxylon shrubs are so hard that they can rip even the sturdiest tires. The unbearable heat deadens attentiveness – the temperature in the cars can crawl up to 50 degrees Celsius. The drivers reach the finish line with their suits drenched. Although the drivers had been prepared for the heat and the terrain, the bird attack took them completely off guard. On the way to Balkhash a flock of sparrows crashed into the KAMAZ-master truck driven by Eduard Nikolayev. Judging by the feathers stuck to the hood, the birds were not very lucky. But Nikolayev was fortunate and made it to the finish line as overall leader. Others were not as lucky. For example, the crew of Han Wei's Geely Boyue SMG Team from China was left without a windshield after the encounter with the birds. At the Silk Way rally Nikolayev is driving a new test truck, which can easily be distinguished by its black color and the hood, so unusual for a KAMAZ. For now Nikolayev is unstoppable: He is flying ahead of everyone else, leaving behind him a cloud of dust. He has not had any accidents or breakages, something that cannot be said for French driver Stephane Peterhansel. 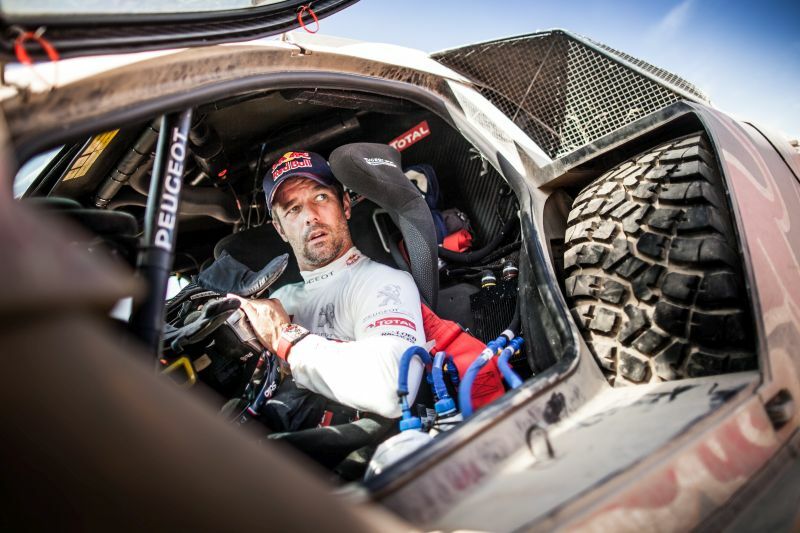 The 16-time Dakar champion, who is driving the Team Peugeot Total off-road vehicle, has already had to go through many unpleasant moments. Although in the first legs he leaped into first place in the tournament, Peterhansel then got into a serious accident that deprived him of any chance of winning: His vehicle turned over three times after coming across an obstacle. Fortunately, the crew was not injured, but it took three hours for Peterhansel to start the engine and slowly drive to the finish line. During the night his car was assembled anew. In the morning, as if nothing had happened, the racer stormed through the steppe. Despite being a long way behind, the legendary driver will make it to the end of the Silk Way. Right from the beginning the drivers had to forget about sleep. Due to the long 700-800-kilometer hauls the competitors and the journalists reach the end point of the stages at night, before getting up in the morning at 3 or 4 a.m.
Because of the time difference with Moscow (in Kazakhstan +3 hours, in China +5 hours) rest must be sacrificed. The light is on all night in the bivouac – the mechanics prepare the cars for the start. Anyone who wishes to get a couple hours of sleep must get used to the sound of the generators and engines and the projector light striking their eyes. If it was not for the lack of sleep, the halts at the intermediate points between the special stages could be called comfortable. The bivouac looks like a small temporary town, with "blocks" for the teams where they can put their machines. It also has a restaurant where you can eat and take something to go. There is also a field shower with men and women's sections. Since men make up the majority of competitors, they have to wait in line. Most participants live comfortably – in portable houses. The rest sleep in tents. Everyone complains about the rain, the cold, the heat or the mosquitoes. But soon they forget all that. The farther the caravan goes, the deeper is the sleep. The Silk Way Moscow-Beijing Rally is taking place between July 8 and 24. There were 116 crews at the start: 23 trucks and 93 off-road vehicles. The drivers must drive 6,670 miles (10,734.89 kilometers).